Ruckus huddled in a blanket beneath the passenger seat of my friend Judy’s old car. The young puppy peered at me with intense black eyes. Those orbs talked. They flashed the insecurity of dogs fresh from the pound, and the silent interrogatory of every dog, Are we friends? I reassured puppy Ruckus. Ruckus soon journeyed to my home, where he met then-puppy Lucy, our miniature pinscher. Ruckus caromed into the fenced back yard, where he tore fifty foot circles until he collapsed in delighted exhaustion. He taunted Lucy for refusing to join his sloppy, silly sprints. Ruckus sprang from alley breeding, a terrier’s ebullient heart in a body of ungainly dachshund stretch. His long low body and powerful legs carried his sweet face at tremendous accelerations, bounding off walls, tearing around corners. When Judy traveled, Ruckus visited Lancasters, to sniff out Hamlin Park, to splash at Richmond Beach and Edmonds dog park, and most to torture Lucy. Ruckus was Life itself gushing through a dog-shaped orifice. One leap too many, one vault down stairs beyond the pale. Ruckus injured his improbable spine. His hindquarters no longer obeyed terrier imperatives. Hydro-therapy helped, but offered no cure. Time passed. After consultations, Judy bore Ruckus to Washington State University. Spinal surgery improved function, but not greatly. Ruckus’s bladder still needed manual expression. Bowels moved naturally, but unpredictably. Ruckus got diapers and a cart for his back half. Muscle memory gave him occasional jumbled walking motions, like a drunken sailor in a bobbing skiff. 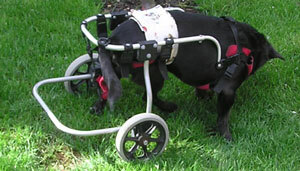 Slowly, the dog improved; Ruckus’s gait peeked out. But recovery was not to be. Ruckus reinjured his spine. The cart and diapers would be permanent. Though Ruckus’s pain must be substantial, he never betrays it. Sores on limp feet must be bothersome, the chafing of his cart an annoyance. One would never know. Ruckus runs with the same abandon as his first trip around our yard. He tires sooner, dragging half a dog on a cart behind him. But Ruckus’s ecstatic thirst for life perseveres. Troubles do not deter Ruckus. If Ruckus were a talking creature, he would implore us that all is well. Ruckus does what a Ruckus is born to do: careen with abandon and spill laughter. William James (American, 19th century A.D.) said: “For to miss the joy is to miss all” (On a Certain Blindness in Human Beings). Ruckus knows.